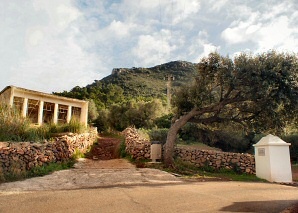 The hill, Puig de Santa Àgueda (in Arabic Sent Agaiz), 264 m above sea level, is the third highest peak on Menorca, after Toro (357 m) and Puig de s'Enclusa (274 m). The hill, situated in the municipality of Ferreries, has excellent views over the coast on the north of the island. The peak is occupied by the remains of the Santa Àgueda Castle, the most important heritage of Islamic Menorca. In 1287, when King Alfonso III of Aragon conquered the island, Santa Àgueda was the last stronghold of the Arab troops. Although the remains of the castle belong mostly to the Moslem era, it is thought that the fort has its origin in some Talayotic buildings, later occupied by a Roman camp. The Christians also carried out reforms and repairs to the castle, including the construction of a chapel dedicated to Santa Àgueda. In the middle of the XIV century the castle was unoccupied and although since then it has had different uses, it has suffered serious deterioration caused by the weather and other factors. It is thought that the chapel was transformed into a house in the XIX century and that the stone paved ascent, although in a Roman style, dates from the same time. In spite of the decay of the castle, a visit is really interesting, both from a cultural and scenic point of view. The excursion there and back takes about 2 hours. The starting point on foot is the abandoned rural school on the Camí dels Alocs, by the entrance to the Santa Cecilia property. The majority of geographic points on Menorca have their own legends and the Santa Àgueda Castle is no exception. Amongst several the most important is the legend of the "Vedell d'Or" in which a Golden Calf is hidden underneath the walls of the fort.